Measuring about 20 feet tall and 12 feet wide, the Red Dragon spacecraft will not carry astronauts, but it will land on Mars to show the new capsule’s ability to reach far-flung destinations throughout the solar system, SpaceX said. Musk plans to reveal SpaceX’s concept for sending humans to Mars in September at the 67th International Astronautical Congress in Guadalajara, Mexico. SpaceX announced the first Red Dragon mission on the company’s social media accounts Wednesday. Musk has kept details of SpaceX’s Mars initiative secret ahead of his presentation later this year in Mexico. More than half of Mars missions have ended in failure, and NASA is the only space agency to successfully land a spacecraft on the red planet and return useful science data. NASA said it has similar agreements with other U.S. companies and institutions, but none of those plan to launch their own mission to Mars. 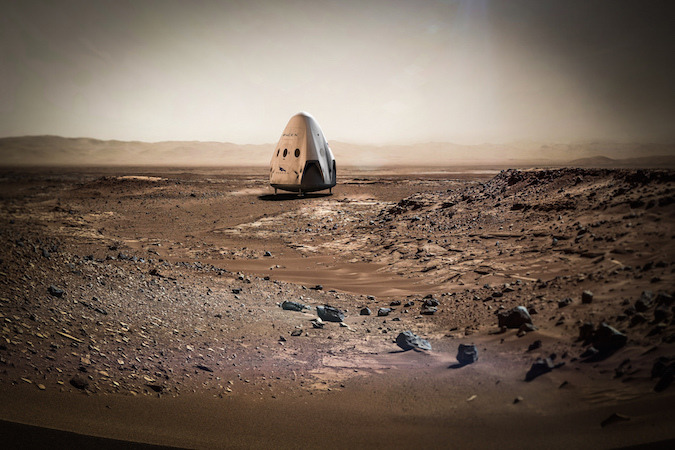 NASA and SpaceX officials signed the agreement outlining the partnership on the 2018 Mars mission earlier this week. The accord is not a contract — it involves no exchange of money — but it says NASA will support SpaceX’s mission with deep space communications and telemetry, deep space navigation and trajectory design, entry, descent and landing system analysis and engineering support, Mars entry aerodynamic and aerothermal database development, general interplanetary mission advice and hardware consultation, and planetary protection consultation and advice. The Red Dragon concept is not new, and NASA has been secretly working with SpaceX on the mission plan since 2014, according to the agreement released by the agency Wednesday. The agreement also says SpaceX must publicly release all scientific data collected by the Red Dragon mission within six months of its acquisition. It also says science data collected by instruments NASA could place aboard the capsule will be public domain, keeping with agency policy for its government-owned interplanetary probes. NASA is dispatching its own spacecraft to Mars in 2018 with a scientific package to study the red planet’s interior by detecting seismic tremors. The InSight lander was supposed to blast off this year, but problems with one of its research instrument forced a delay. 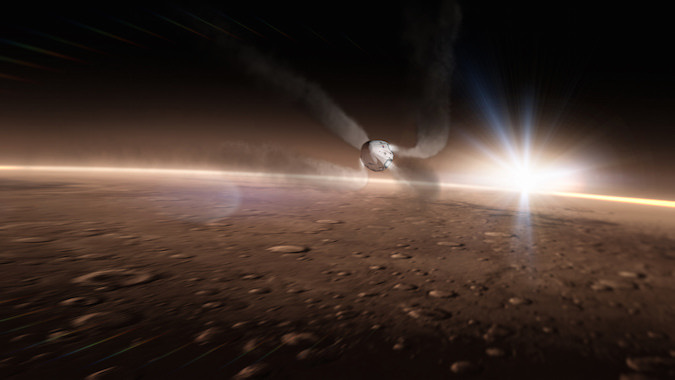 SpaceX released illustrations of the Red Dragon spacecraft landing on Mars last year, and Musk discussed the Dragon capsule’s exploration capabilities before Wednesday’s announcement. The Dragon 2 spacecraft is the next version of SpaceX’s space transport capsule, introducing major overhauls to the Dragon cargo carrier currently flying on resupply flights to the International Space Station. The next-generation Dragon will fly astronauts to the space station and feature SuperDraco jetpacks to push the crew away from a failing rocket — if required — during launch. 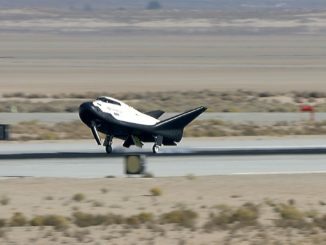 The eight SuperDraco engines, burning a mixture of hydrazine and nitrogen tetroxide propellants and made with 3D-printed parts, can cumulatively produce up to 120,000 pounds of thrust. If the thrusters are not used during launch, the SuperDracos can steer the Dragon capsule to propulsive landings on Earth at the end of its mission. The human-rated version of Dragon, set to debut with astronauts by the end of 2017, will initially fly with four parachutes and splash down in the ocean. 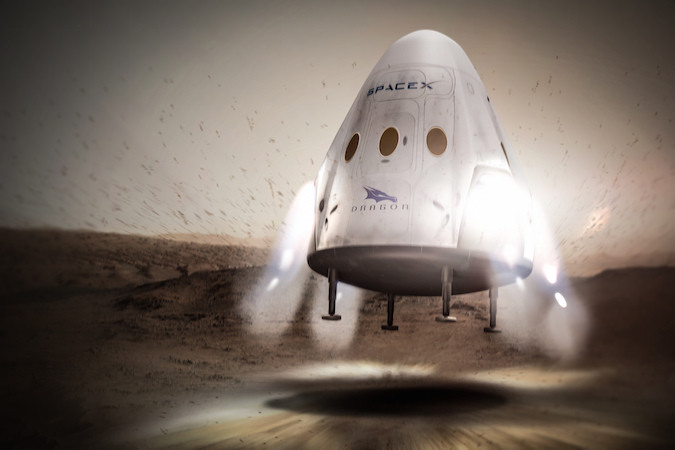 SpaceX hopes to certify the propulsive landing capability for crewed missions in a few years. 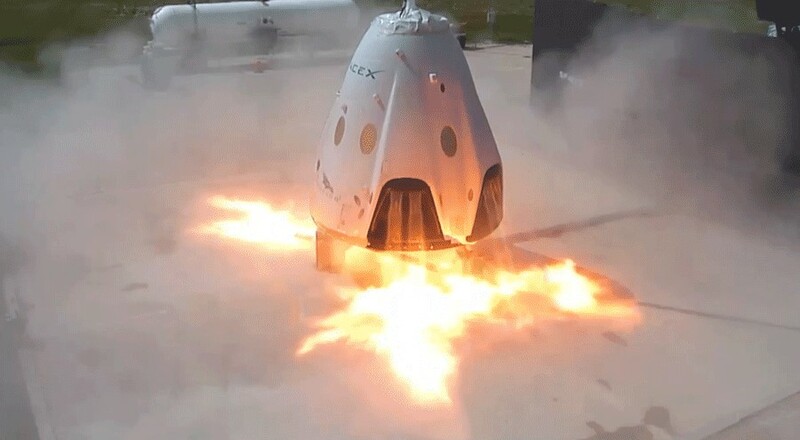 Musk touted the second-generation Dragon’s capacity for interplanetary missions last year, after the first flight test with SuperDraco thrusters at Cape Canaveral to prove the Crew Dragon’s ability to quickly escape a catastrophic rocket mishap on the launch pad. The Dragon 2 is “capable of transporting scientific payloads to anywhere in the solar system — with a liquid or solid surface, and with or without an atmosphere,” Musk said in May 2015. He added the Dragon spacecraft, coupled with a launch on the behemoth Falcon Heavy rocket, could put two to four tons of science hardware on Mars. The largest craft ever landed on Mars to date is NASA’s Curiosity rover, with a mass of about one ton. Heavier landing probes need advanced parachutes, heat shields, or propulsive braking, the technique favored by SpaceX. 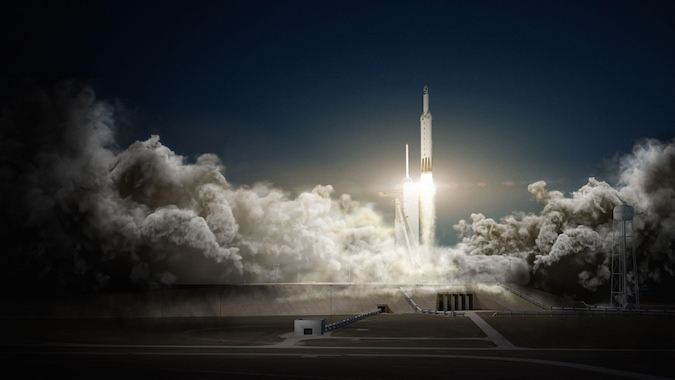 Artist’s concepts accompanying Wednesday’s brief statement showed the Red Dragon mission launching aboard SpaceX’s new Falcon Heavy rocket from launch pad 39A at NASA’s Kennedy Space Center in Florida. Opportunities for direct trips to Mars come every 26 months, when the planets are correctly positioned in the solar system to make the journey possible. The next Mars launch window opens in May 2018. 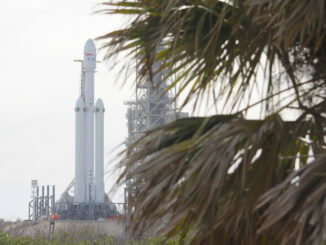 The first flight of the Falcon Heavy — made from three Falcon 9 rocket boosters bolted together — is scheduled for no sooner than November after several years of delays. 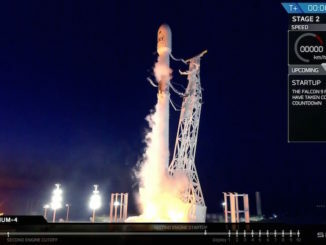 The Red Dragon mission would be SpaceX’s first launch to another planet, and its development comes as the California-based company makes strides in reusing the first stage of its Falcon 9 rocket, builds a commercial spaceship to ferry astronauts to orbit, and tries to keep the Falcon 9 flying reliably, and on time, to satisfy customer demands. But it is clear the Red Dragon mission is just a stepping stone to grander ambitions. Human missions to Mars will need a much larger craft, Musk said.